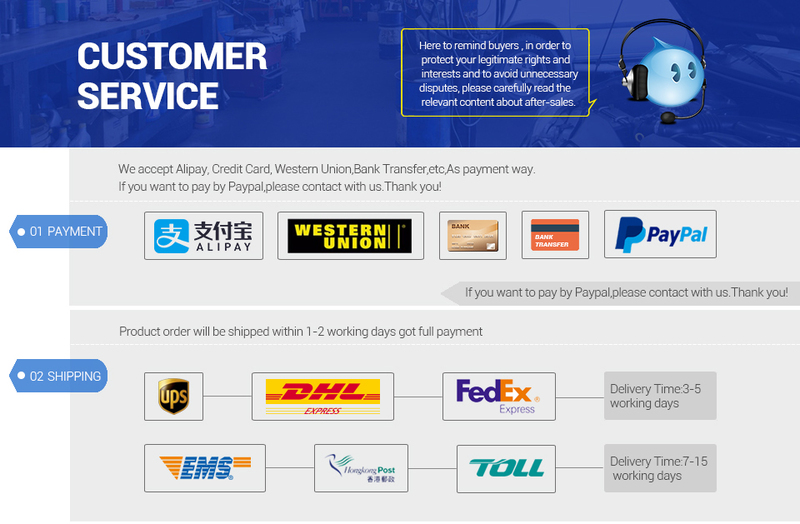 Works on most 1996 US-based, 2000 EU-based and Asian cars and OBDII & CAN protocols vehicles with multilingual support including English, German, French, Spanish and Portuguese, etc. 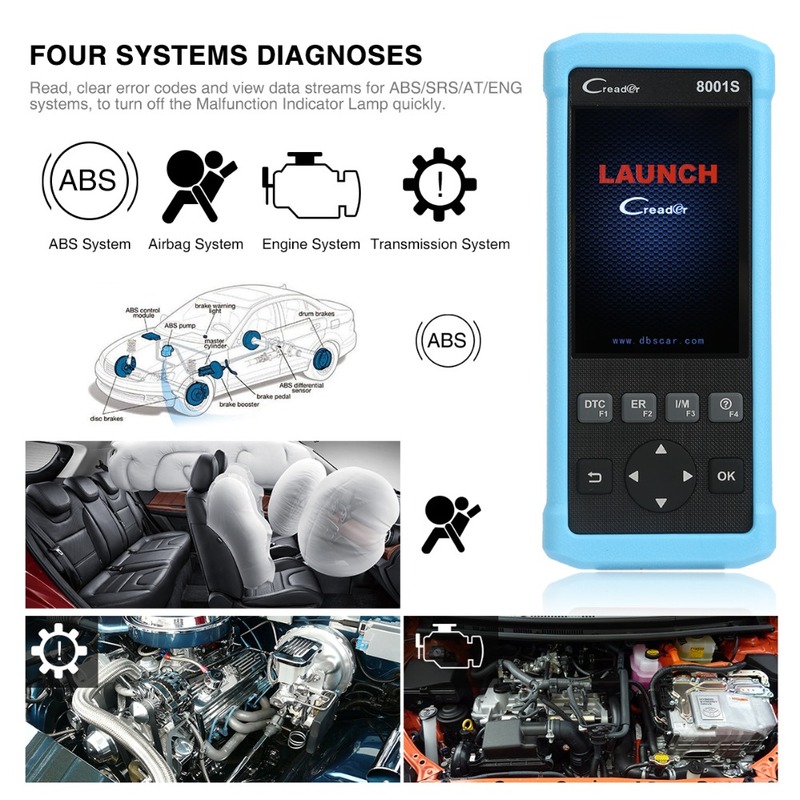 Provides full OBDII functions including but not limited to reading/clearing DTCs (Diagnostic Trouble Code), reading vehicle information, checking the readiness status of the car and turning off the Malfunction Indicator Light (MIL). 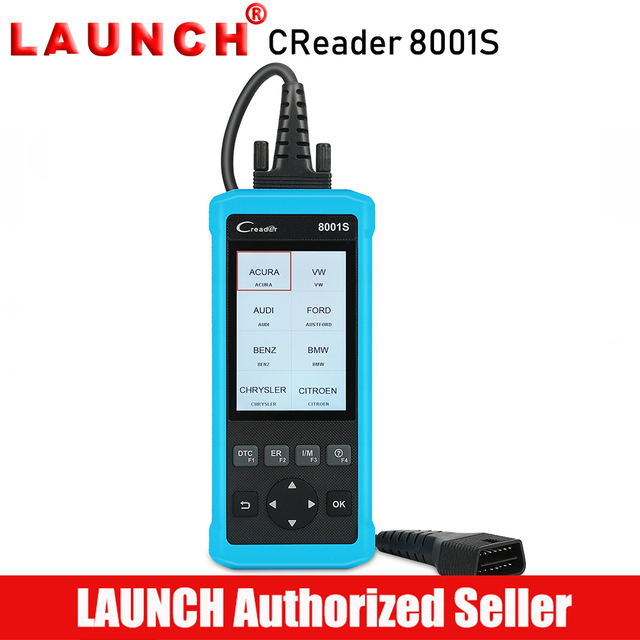 LAUNCH CR8001S features oil service reset, EPB (Electronic Parking Brake) reset, SAS (Steering Angle Calibration) reset and BMS (Battery Maintenance System) reset to fix the problem involved for better user experience. In addition, it supports ABS/SRS/AT/Engine diagnosis to facilitate all-around car detection. And it boasts an amazing technical specification for lightning fast vehicle diagnosis. 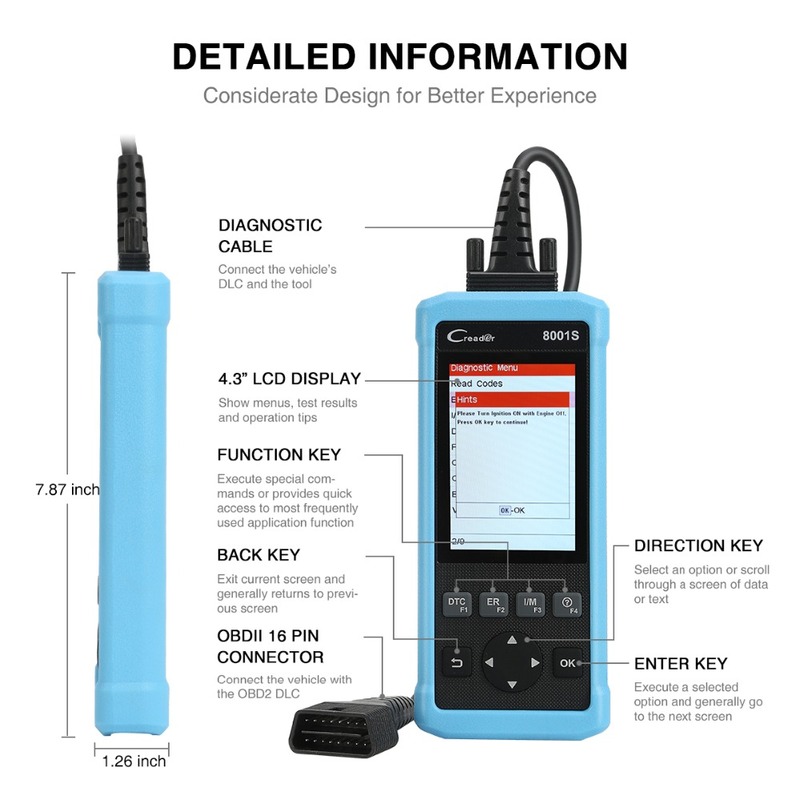 Features a 4.0-inch color display to show data streams in graphical way plus Query freeze frame data/DTCs function to provide simple and easy diagnostic work for users. 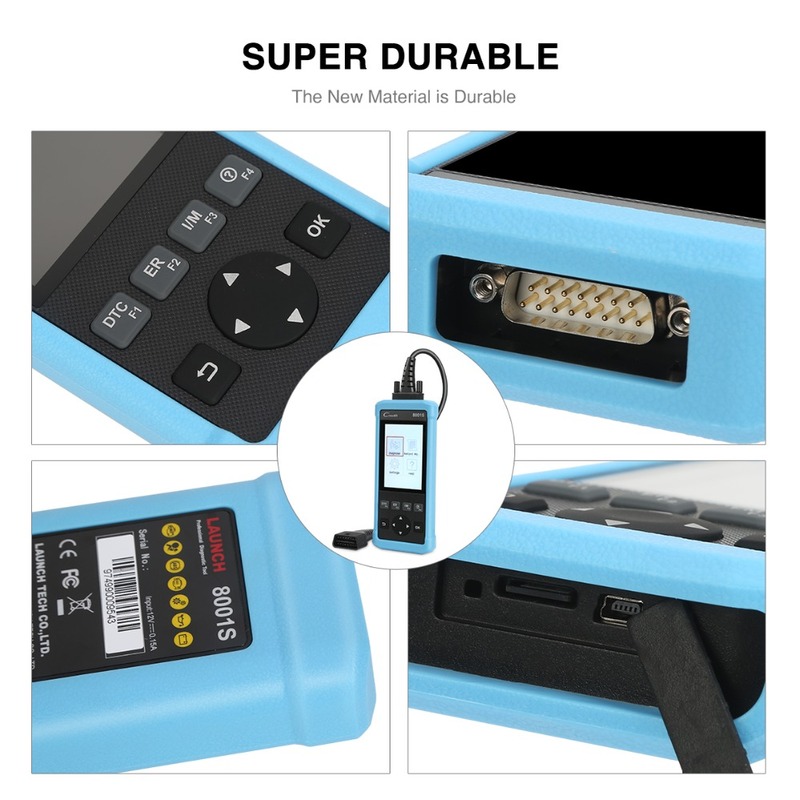 Carries a complete 12-month guarantee from date of sale to ensure it is reliable and suitable for diagnosing work, and 1 year free update at our official site for user's convenience. LAUNCH, in line with the enterprise culture of "innovation, quality, efficiency, specialty and competition", dedicates itself to be a leading position in the automotive diagnostic equipment industry with the support of powerful technology and considerate service to offer superior user experience for customers worldwide. 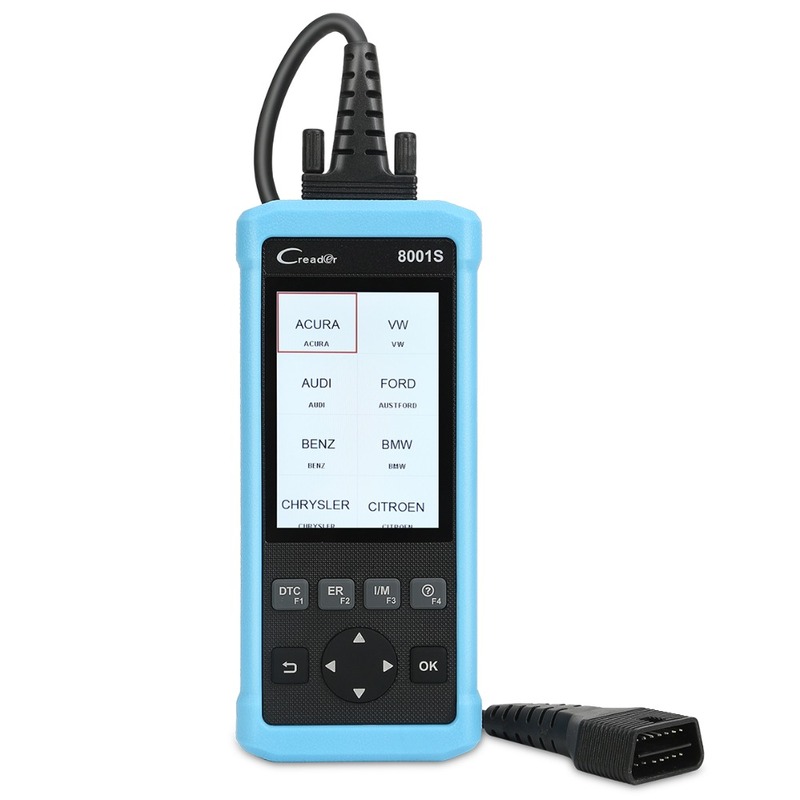 LAUNCH CR8001S is a scanner tool equipped with 4.0-inch color display which is focusing on OBDII detection for OBDII&CAN protocols vehicles, featuring 4 hot-keys to offer quick access to hot functions, and Oil/EPB/SAS/BMS reset plus ABS/SRS/AT/Engine diagnostic functions for providing users with simple, fast and cost-effective diagnostic results. 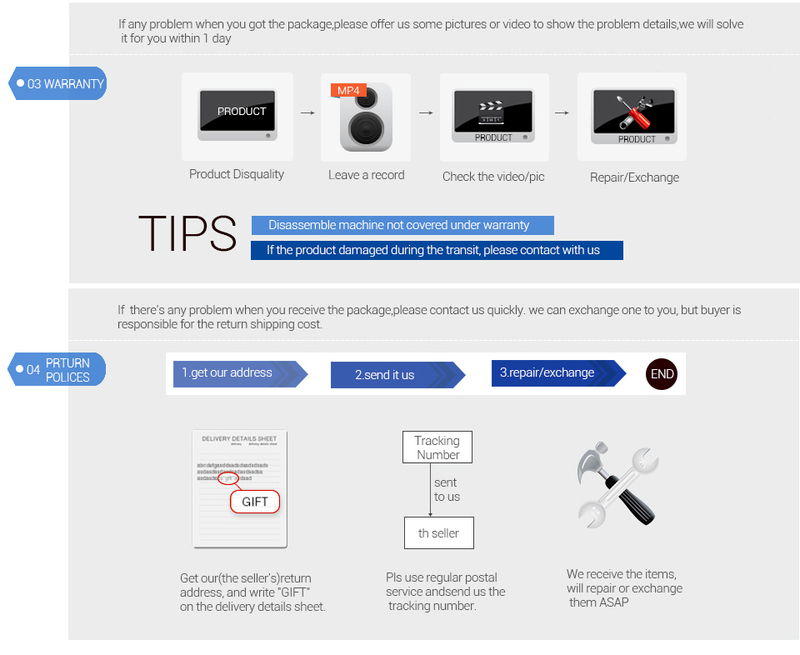 Read Codes: Retrieve generic (P0, P2, P3, and U0), manufacturer specific (P1, P3, and U1) codes and pending codes. Erase Codes: Turn off Check Engine Light (MIL), clear codes and reset monitors. Read I/M Readiness Status: Show whether the various emissions-related systems on the vehicle are operating properly and are ready for inspection and maintenance testing. Live Data: The View Data function allows viewing of live or real time PID data of vehicle's computer module(s). O2 Monitor Test: Allow the retrieval and viewing of O2 sensor monitor test results for the most recently performed tests from the vehicle's on-board computer. Freeze Frame Data: View the vehicle's operating parameters at the moment a DTC (Diagnostic Trouble Code) is detected. Component Test: Allow initiating a leak test for the vehicle's EVAP system. Vehicle Information Retrieval: Display the information such as VIN (Vehicle identification Number), CID (Calibration ID) and CVN (Calibration verification number), etc. 2. 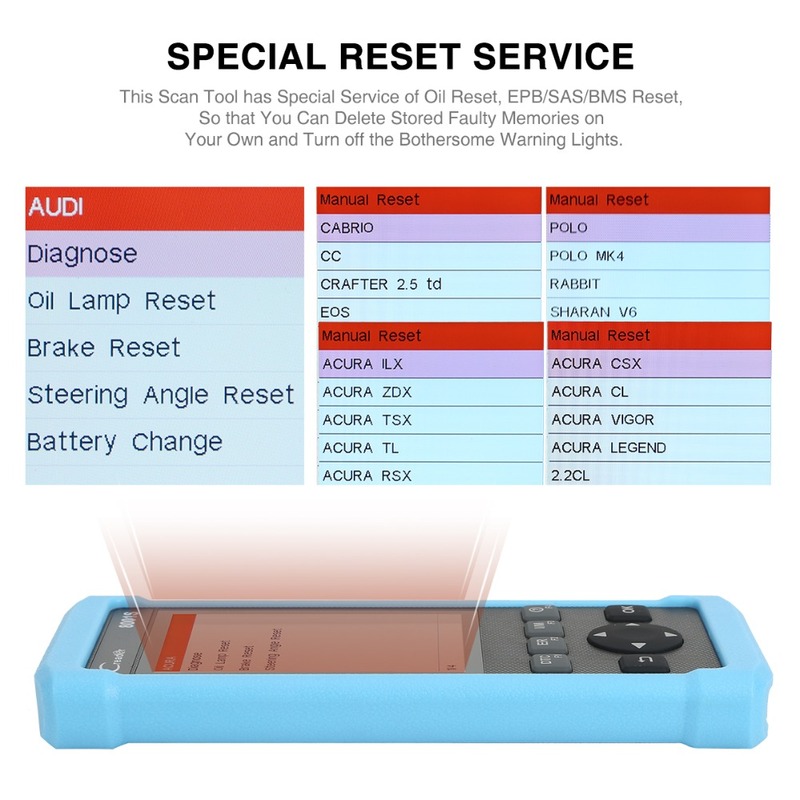 Reset Service: CR8001S provides ten OBDII/EOBD diagnostic modes and also the following reset functions: oil reset, EPB reset, SAS reset and BMS reset. Oil Reset Service: Clear the Oil warning light; perform reset for the engine oil life system. Electronic Parking Brake Reset (EPB service): Reset the brake pad after repairs in electronic parking brake system are done. Steering Angle Calibration Service (SAS service): Calibrate the steering angle sensor after the replacement to make sure the ECU issued the correct steering instructions and memorize the max angle's position. Battery Maintenance System Reset (BMS service): Perform a reset on the vehicle battery for clearing the fault information and re-match the battery. Transmission: Retrieve the Automatic Transmission (AT) information which is a type of motor vehicle transmission that can automatically change gear ratios as the vehicle moves, freeing the driver from having to shift gears manually. Engine: Easily determines the cause of Check Engine Light, and turn off the warning light. SRS: Read/clear the error codes and reset the crash data in Supplemental Restraint System (SRS), and turn off the warning light. 4. Colorful and Graphical Display of Data Streams: CR8001S displays the data streams in graph, which will clearly show the data and you can make sure whether the data are in normal range and deal with some malfunction parts. 5. 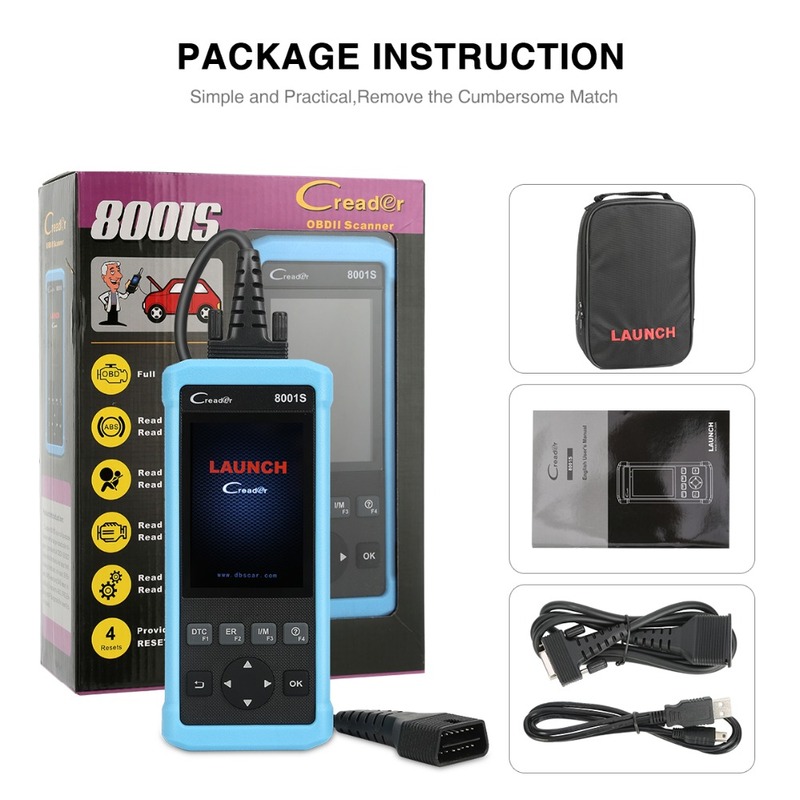 Built-in DTCs for Lookup: CR8001S offers diagnostic trouble code definitions helping and fast guiding you to fix the car, making sure you can easily understand the problem and the solution. 6. 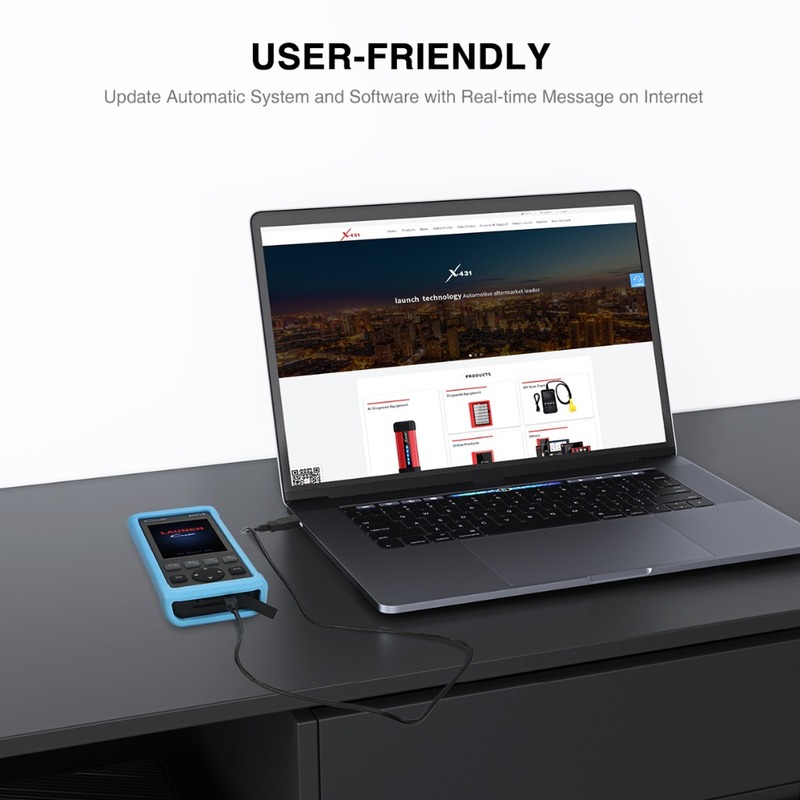 Thoughtful Service: One year free update via internet with multilingual support including English, German, French, Spanish and Portuguese, etc. And users can connect the scan tool with computer to print diagnostic worksheet for consulting or backup. 7. Supported Brands: for Acura, for Daewoo, for Honda, for Holden, for Hyundai, for Infiniti, for Isuzu, for KIA, for Lexus,for Mahindra, for Maruti, for Mazda, for Mitsubishi, for Nissan, for Subaru, for Suzuki, for Toyota, for Tata, for Chrysler, for Ford, for Gm, for Eu-Ford, for Aus-Ford, for Alfa-Romeo, for Audi, for Benz, for BMW, for Citroen, for Dacia, for Fiat, for Jaguar, for Lancia, for Landrover, for Mini, for Opel, for Peugeot, for Porsche, for Renault, for Saab, for Seat, for Skoda, for Smart, for Sprinter, for Vauxhall, for Volvo, for VW. 8. Supported Languages: English, Japanese, Russian, German, Polish, Italian, Turkish, Korean, Czech, Portuguese. Spanish, French. Please close the anti-virus software before updating this tool.